The New Regal Theater — the 86-year-old South Side showplace that is one of the city&apos;s finest remaining examples of vintage movie palace architecture — is for sale. Asking price: $100,000. A city landmark, the theater is being sold by the Federal Deposit Insurance Corporation which took ownership in 2011 after the bank holding the building&apos;s mortgage failed. An FDIC spokesman said the New Regal, 1645 E. 79th St., had been under contract for $99,000, but the deal fell through and the theater has been placed back on the market. The FDIC is responsible for the big building&apos;s upkeep — a motivating factor behind the cut-rate price. Chicago&apos;s U.S. Equities is handling the listing, but representatives from the company did not return phone calls seeking comment. The New Regal has been closed since 2010 and faces some big-ticket repairs. According to the city&apos;s inspection reports, violations include "severe structural damage" on the building&apos;s four corners, each of which are "are separating from building structure." In addition, the building has been cited for having dangerously loose and missing terra cotta, washed-out mortar, potentially unstable chimneys and more. 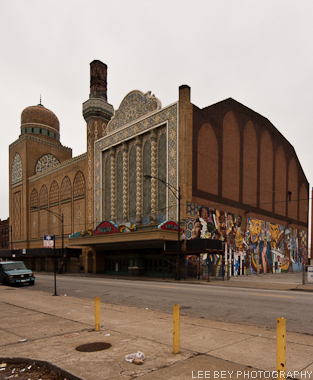 The conditions prompted Landmarks Illinois to place the theater on its "Ten Most Endangered Places" list back in 2011. Preservation Chicago followed suit a year later. The New Regal&apos;s exterior and interior are under city landmark protection. A spokesman for the Department of Housing and Economic Development said the agency believes the low sale price is potentially good, given the building&apos;s condition. "It would enable a potential buy to invest more into the building than into the acquisition cost," said department spokesman Peter Strazzabosco. Even with its problems, the New Regal is in far better condition than the landmark Uptown Theater which sold for $3.2 million in 2008. The Uptown, 4816 N. Broadway, bears the scars of 30 years of decay, vacancy and disuse — its owners believe it could take as much as $40 million to restore the place (WBEZ&apos;s Jim DeRogatis recently pegged the number at upwards of $70 million) — while the New Regal interior remains quite the showplace as photographer Matt Lambros documented in these spectacular images from 2012. 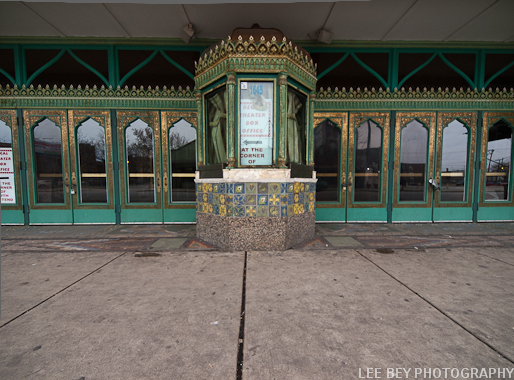 Designed by John Eberson and built in 1927 as the Avalon Theater, the dazzling Moorish style building was inspired by an intricate metal Persian incense burner Eberson found in a Royal Street antique store in New Orleans. The 2500-seat movie theater could also accommodate live shows. In 1985, the theater was later purchased by Soft Sheen products founder Ed Gardner and his wife Bettiann. The restored theater re-opened as the New Regal in 1987, in honor of the legendary Regal Theater, 47th and King Drive, that was demolished in 1973. The theater has had subsequent ownership since.